Statistics show that 80% of adults will experience a back injury in their lifetime. More than one million back injuries are sustained in the workplace each year and 80% of those injuries are associated with manual tasks lifting materials. Much of this can be attributed to the fact that most people don’t know how to lift heavy objects properly. Repeated lifting of materials, sudden movements, and lifting and twisting at the same time can all cause back injuries. You can prevent back pain by preparing when you know you will be lifting heavy objects. Take some time to inspect the items you will be moving. Test their weight and decide if you will need assistance or if you can lift it yourself. You can also prepare the items you will be lifting to ensure they are as easy to move as possible. Pack smaller boxes instead of larger ones, disassemble furniture to make it lighter and plan to use a cart or dolly if needed. Map out a safe route to between the two spots you will be lifting objects between. Ensure there is nothing blocking your path and that there are no tripping hazards or slippery floors. Stretch your muscles to prepare them for the strenuous activity ahead. A warm-up increases the temperature in your muscles which makes them more pliable, increases your range of motion and reduces your risk for injuries. When lifting heavy objects two things can lead to injury: overestimating your own strength and underestimating the importance of using proper lifting techniques. Always think before you lift and plan your moves ahead of time. Keep a wide base of support: Use your feet as a stable base that will hold your entire body in position during the process. Your feet should be shoulder width apart with one of your feet slightly more forward than the other. Keep your chest forward: Ensure that your spine is aligned by keeping your chest forward and your abdominal muscles engaged. Your shoulders should be back and your face straight ahead. Keep your upper back as straight as possible. Lift with the legs: Bend your knees, not your back, and squat down to grab the object you will be lifting. Use your leg muscles to lift the object up off of the ground. Lead movement with the hips: Be sure you are not twisting your back or extending too far in front of you by leading your movements with your hips. The rest of your body should always face the same way as your hips. 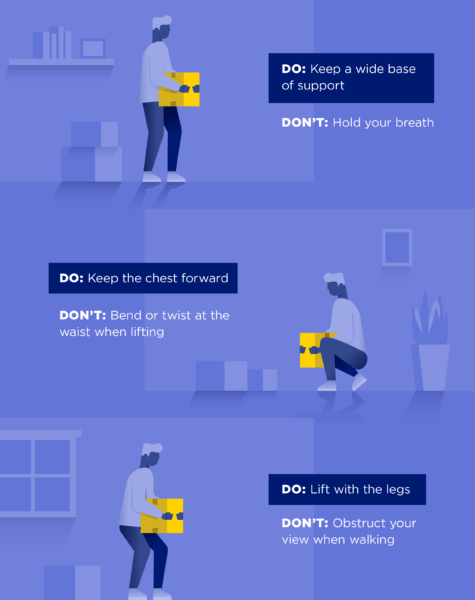 Keep heavy objects close to your body: Keep items as close to your waist as possible to ensure that the weight is centered and distributed evenly throughout your body. Keeping objects close to you will also help you maintain your balance and ensure your vision is not obstructed. Avoid lifting heavy objects over your head. Push objects rather than pull: It’s safer for your back to push heavy items forward than pull them towards you. This way you can use your leg strength to help move objects forward. A study by the Annals of Internal Medicine found that practicing yoga to prevent or treat back pain was as effective as physical therapy. If you are experiencing back pain as a result of improper lifting technique or simply want to soothe your back after lifting heavy objects there are simple stretches you can do to help alleviate the pain. While these are technically yoga poses they are approachable. These stretches are basic and will feel soothing on your muscles rather than strenuous. 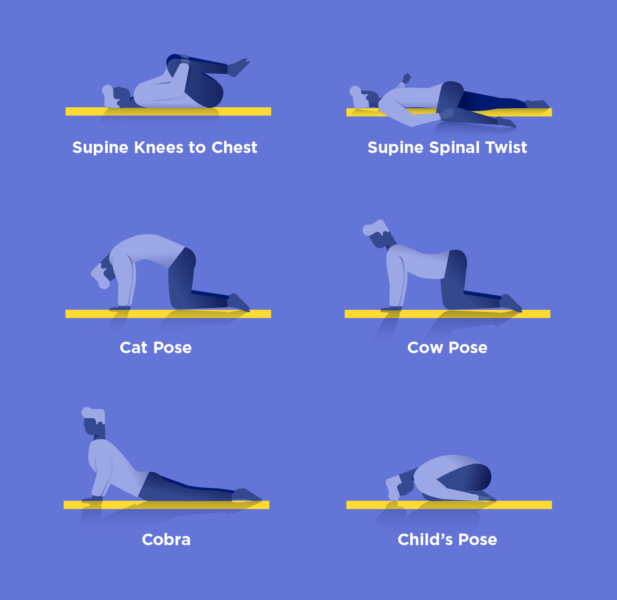 Here are some stretches for back pain relief. Supine Knees to Chest: Lie on your back on a soft yet firm surface (a yoga mat works nicely) with your arms and legs extended. Inhale. As you exhale, pull your knees up to your chest keeping your back on the floor. Stay here a few breaths, then release. Supine Spinal Twist: Lie on your back with your arms stretched out and your palms facing the ceiling (in a T position). Raise your right knee and twist so that it crosses over the left side of your body. Keep your shoulders on the floor and relax into this position for a few breaths, then release. Cat/Cow Pose: Start on your hands and knees with your hands under your shoulders and your knees under your hips. Fingertips should be pointing directly in front of you. Inhale as you drop your belly towards the mat, exhale as you draw your belly into your spine and round your back to the ceiling. Repeat 10 times slowly, then relax. Cobra Stretch: Lie on your stomach, head lifted, with the palms of your hands on the floor and the tops of your feet facing down. Hug your elbows back into your body. Inhale as you begin to straighten your arms to lift the chest off the floor and puff the ribs forward. Try to distribute the bend evenly throughout the entire spine. Child’s Pose: Begin on your hands and knees, then exhale as you bring your knees to the floor and your arms outstretched in front of you. Rest your buttocks on your heels and dip your torso between your thighs. Allow your forehead to come to the floor and rest there for a few breaths. 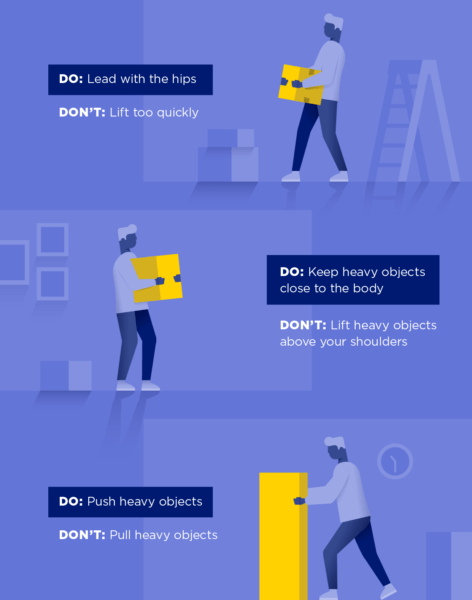 Since using a self-storage unit often requires some heavy lifting, we’re sharing our knowledge about proper lifting techniques and ways to avoid injuries when moving heavy boxes, furniture or other objects. If you plan ahead and make the appropriate preparations before you will be lifting heavy objects it should help you avoid an injury. Using proper lifting techniques and keeping your spine aligned during the process will also help prevent injury. Should one occur, or should you preventatively want to stretch afterward, using these simple yoga poses will soothe your back into alignment!